If you want to avoid blowouts you need to ensure you ALWAYS have enough air in your tires. If you start your day low on inflation, your tire will run hotter than desired and this will accelerate the rubber degradation. With enough degradation your tire will loose strength and this might lead to a failure. You need to do two things to help avoid this problem. First you need to have at least the minimum inflation needed at the start of EVERY trip. Second you should monitor your inflation so you receive a warning if you have a puncture, cut or valve leak. This means having a TPMS. Lets address the minimum cold inflation level needed. Some people get different opinions on what inflation to use based on the idea that what others inflate their tires to is what they should use. Sometimes they depend on what the salesman at the RV store says and sometimes they depend on their brother-in-law. 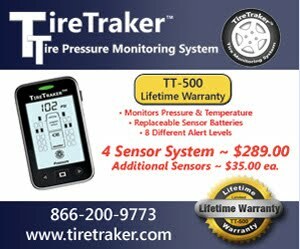 Well my job as a Tire Engineer is to give you the facts on tire loading and how to confirm you have at least the minimum needed tire inflation for your motorhome. First it is important to tell people with Trailers that this information DOES NOT APPLY to you. Your multiaxle configuration places extra side loading on your tires so you need to read THIS blog post. Second it is very desirable to know the actual loads on each corner of your RV as your loading is never exactly balanced side to side. Now I know that it is not easy to get your actual corner loads. While some have used RVSEF and others have found truck scales where they can do the multiple weights needed to complete the worksheet HERE, a good portion can only get their total axle loads at a CAT scale. The goal of this post is to walk you through the process of what to do if you only can get axle loads. You can use this until you learn your real corner loads. 1. You should have a tire placard or spec sheet posted on the wall of your RV. It shows the suggested inflation based on what the manufacturer thinks you will be carrying. Use this till you get on a scale. 2. With your RV fully loaded with the fuel, food, clothes, people, toys and even your bowling ball collection if you normally carry that around :-) get on a truck scale to learn what your axle weights actually are. 3 Assume you have some imbalance so calculate that one side of each axle is loaded to 55% of the total. Lets assume your Front axle gave you 8910# so 55% of that is 4900.5 and rounding up we would want the minimum inflation needed to carry 4901#. According to MI chart that would be 4975 which gives 100psi as your minimum cold tire inflation. Add your 5 psi margin and you know you need to set the fronts at least to 105 psi when "cold"
Moving to your rear duals. With a scale reading of 15,010# we would find 55% of that or 8255.5 or 8256# for the TWO tires on the heavier side of the RV. Looking at the MI chart we find 8410 as the load number which indicates 90psi add the 5 psi margin and we have 95psi. Tag axle Assume you have the axle loading set so the scale reads 7560#. 55% of that is 4158 and looking at the chart we see 80psi. Adding the 5psi margin you now know you need 85psi cold in the tag tires. Remember ALL tires on each axle should have the same cold inflation. COLD inflation means not having been driven on more than 2 miles in the previous two hours and not being in any sunlight in the last two hours.